McCain Ineligible to be President? You be the Judge. McCain was born in the Panama Canal Zone in 1936 to American-born parents. The Canal Zone was a Territory of the United States, not a State or even a Possession. His birthplace was a U.S. military base within the Zone. Most Constitutional experts seem to feel that McCain would win any court challenge, but clearly a challenge could prove messy and the outcome unpredictable. If it was legally challenged before or during the election it could hurt his election chances, and a challenge after his inauguration could prove disastrous for the country. What would happen if he became president, a challenge was mounted and the Supreme Court ruled against him? He would be forced to resign the presidency or be removed from office. What a shocking development that would be. 1) The Panama Canal Zone was a Territory of the United States. Anyone born there would likely be considered “natural born”. 2) He was born on an America military base. Surely this would be considered American soil by the court. 3) He was born to parents who were both “natural born Citizens”, that is they were born in the contiguous fifty United States of America. If there is no challenge, at the minimum it should be clarified at some future date simply to avoid confusion. Some interesting factoids illustrate confusion that has already occurred. Fortunately, nothing major has occurred to date. However, McCain is a formidable candidate who has a very strong chance of becoming president. Senator Barry Goldwater of Arizona was the Republican nominee for president in the 1964 election. He was born in 1909 in the then Arizona Territory, three years before it became a state. George Romney who was a presidential candidate in 1968 was born in Mexico. Sure seems to me this wouldn’t meet the criteria, but again it wasn’t tested, likely because he didn’t become the nominee of his party. FDR, Jr. who once considered running was born on Campobello Island in Canada was definitely ineligible in my opinion. President Chester Arthur, whose official birthplace was Vermont, was rumored to be Canadian born. The only official proof of his place of birth is an entry in the Arthur family bible held by the Library of Congress. In fact it is very likely he was not eligible to be president. He was challenged on the issue, but never legally. See my posting in the archives of this blog which delves into that issue. Governor Arnold Schwarzenegger of California has aspirations to be president. He was born in Germany. He has been told he is not eligible, but what about George Romney in 1968. Why was he even eligible to run when he was born in Mexico? If a challenge is mounted this year against McCain look for a special sitting of the Supreme Court to quickly resolve the issue one way or the other. To have a major controversy develop during this important presidential election would be untenable. This entry was posted on Thursday, February 28th, 2008 at 11:52 am and is filed under constitution, current events, election, history, History & Science, McCain, News & Current Events, presidency, presidential election, presidents, republican, romney, united states, usa. You can follow any responses to this entry through the RSS 2.0 feed. You can leave a response, or trackback from your own site. 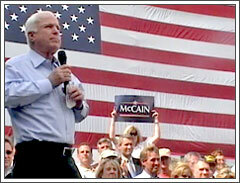 3 Responses to McCain Ineligible to be President? You be the Judge. Thanks for the comment Allen. Yes it appears anything could happen in this election.